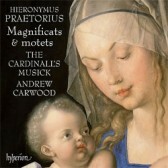 The music of Hieronymus Praetorius is as assured, expressive and original as the Dürer image which adorns the CD cover. Yet this fine composer is much less well-known than his namesake (but not relation) Michael Praetorius. His sophisticated collection of works are written in a variety of forms including the jubilant Venetian polychoral style. The disc contains Praetorius’s second Magnificat quinti toni to which are attached polyphonic arrangements of the popular medieval tunes Joseph, lieber Joseph mein and In dulci iubilo. This later setting of the fifth-tone Magnificat is Praetorius’s masterpiece.